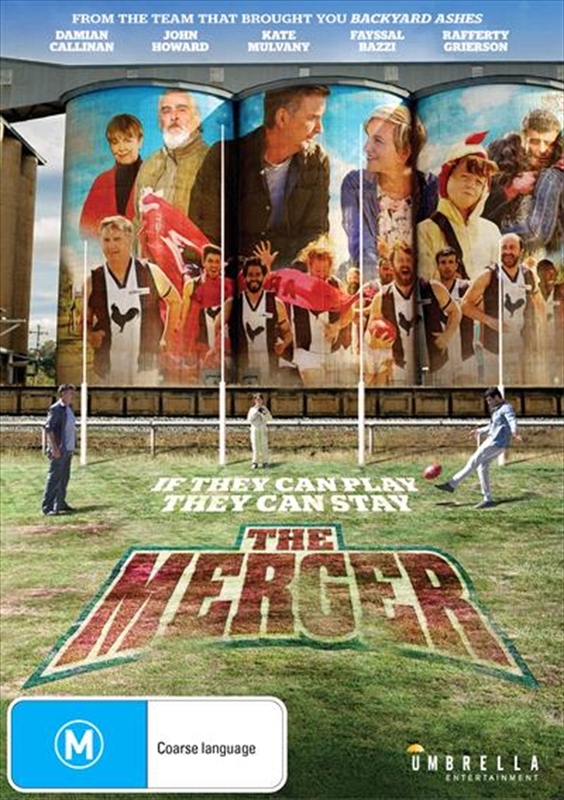 In the tradition of The Castle and Ali's Wedding, one of Australia's most popular comedians, Damian Callinan adapts his entertaining and topical stage play, The Merger for the big screen! Bodgy Creek is a struggling town. The drought won't let up, jobs are scarce after the mill was shut down, and the footy team looks like it will have to merge with another club or fold. Living a hermit-like existence on the towns fringe, former football star turned 'Town Killer' Troy Carrington (Damian Callinan), is coaxed into rescuing the team after striking up an unlikely friendship with young Neil (Rafferty Grierson) who is struggling with the recent loss of his father. Teaming up with Neil's mum Angie (Kate Mulvany, The Great Gatsby) who runs a nearby refugee support centre, they unite to recruit the new arrivals to save the team and take the community on a journey of change. But for some, like Neil's grandfather and Club President, Bull (fan-favourite, John Howard, SeaChange) and 'star' player Carpet Burn (Angus McLaren, Hotel Mumbai), it's more change than they're willing to take. With a winning cast including Penny Cook (A Country Practice), Nick Cody (Please Like Me), Zenia Starr (Hotel Mumbai), Aaron Gocs, Sahil Saluja (Tomorrow, When the War Began), Ben Knight (The Warriors), Stephen Hunter (The Hobbit) and Fayssal Bazzi (Peter Rabbit), The Merger is an hilarious and heart-felt comedy from the team who brought you Backyard Ashes.